Zeid criticised international leaders for failing to act decisively to ensure accountability for the abuses. GENEVA: The UN rights chief warned Tuesday that a "tidal wave of bloodshed" over more than six years of war in Syria had effectively turned the country into a "torture chamber". "As the conflict enters its seventh year, this is the worst man-made disaster the world has seen since World War II," said Zeid Ra'ad Al Hussein, the UN High Commissioner for Human Rights. 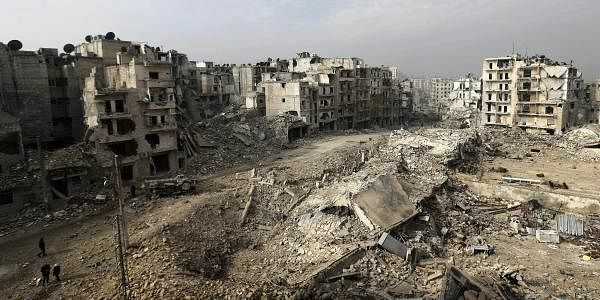 More than 320,000 people have been killed and millions forced to flee their homes since the conflict erupted in March 2011, as protests against President Bashar al-Assad morphed into war following a government crackdown. In an address to the UN Human Rights Council, Zeid said that his office had been refused access to the country and that no international human rights observers had been admitted to places where "very probably tens of thousands of people are currently held. They are places of torture." "Indeed, the entire conflict, this immense tidal wave of bloodshed and atrocity, began with torture," he said, citing as an example the torture of a group of children by security officials over anti-government graffiti six years ago. "Today, in a sense, the entire country has become a torture chamber, a place of savage horror and absolute injustice," he said. The UN and other organisations have repeatedly accused the Syrian authorities of widespread torture. Amnesty International said in a report last August that an estimated 17,700 people had died from torture in custody since the beginning of the conflict, while the Syrian Observatory for Human Rights put the number at at least 60,000. Many others have been executed, and far more have simply disappeared, according to the reports. "We're speaking of a daily continuous massacre that has been going on for six years," Mazen Darwish, a Syrian lawyer who was detained for more than three years, told the UN rights council. "While we are here today, there are civilians, women, children, innocent people who are being killed under torture," said Darwish, one of several Syrian victims and activists who spoke to the council during a special session on Syria. "Vetoes have repeatedly pushed back hope for an end to this senseless carnage and for referral of alleged international crimes to the International Criminal Court," he said. He was referring to a blocked UN Security Council, where Russia in particular has vetoed several attempts to bring a case against Syria before the ICC in The Hague. But Zeid welcomed the UN General Assembly's agreement in December to set up a body to gather evidence on war crimes in Syria, which would build up "the basis for criminal proceedings against individual perpetrators." "Ensuring accountability, establishing the truth and providing reparations must happen if the Syrian people are ever to find reconciliation and peace," he said.